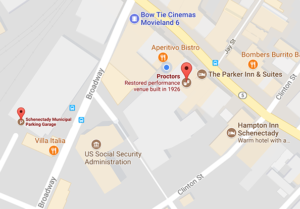 For detailed directions click the Proctors or Parking icons on the Google map. Free Parking on show days in the Broadway Parking Garage provided by Upstate Ford Dealers. Parking in the Broadway Garage is free weekdays after 5 p.m. and all weekend. 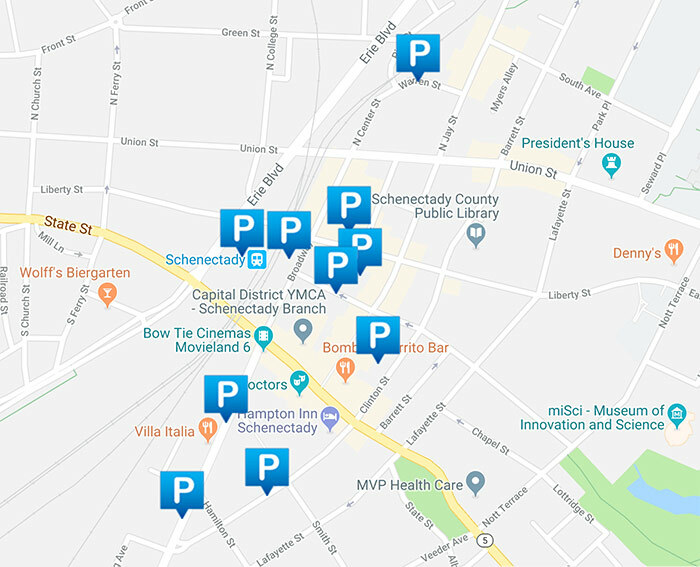 Paid parking at on-street meters and kiosks, weekdays 8 a.m. – 6 p.m.
Visit the Schenectady Parking website to sign up for parking alerts, weather advisories, news and much more! Want to ensure your spot? Pay now through our new LAZ Parking map. Select the show from the dropdown menu below and pre-pay for a parking spot in two area parking lots. From Downtown Albany: Take the 905 bus from the corner of Lodge St. and State St. and get off at the Train Station Stop in Schenectady. This take approximately 57 minutes, no transfers necessary. From Troy, NY: Take the 370 bus from the corner of River St. and Front St. and get off at the State St. and Clinton St stop. This takes approximately 50 minutes, no transfers necessary. From Saratoga Springs, NY: Take the 450 bus from Broadway at Congress Park Centre and get off at State St, and Washington Ave – Gateway Plaza. Head east of State St for 8 minutes; Proctors will be on the right. The bus ride takes approximately 46 minutes. Take the NYS Thruway to Exit 25. From the exit take I-890 to Exit 5 (Broadway). From East turn right at the foot of ramp, left on West onto Broadway. Take Broadway to the second traffic light. Turn left for a pay parking lot; turn right onto S. Clinton St. for two more pay parking lots. For free garage parking, turn left at third light (Hamilton Street) and follow signs. Take Northway (I-87) South to Exit 6. Take Route 7 west into Schenectady to I-890 West. Follow I-890 to Exit 5 (Broadway). Turn right off ramp onto Broadway to the third traffic light. Turn left into the Garage for complimentary parking. The Garage is adjacent to Proctors. Enter the Proctors Arcade under the marquee next to New York State Lottery building. Car parking is free during shows, in the Metroplex parking garage at Broadway and Hamilton street, for Proctors patrons, sponsored by Upstate Ford Dealers. 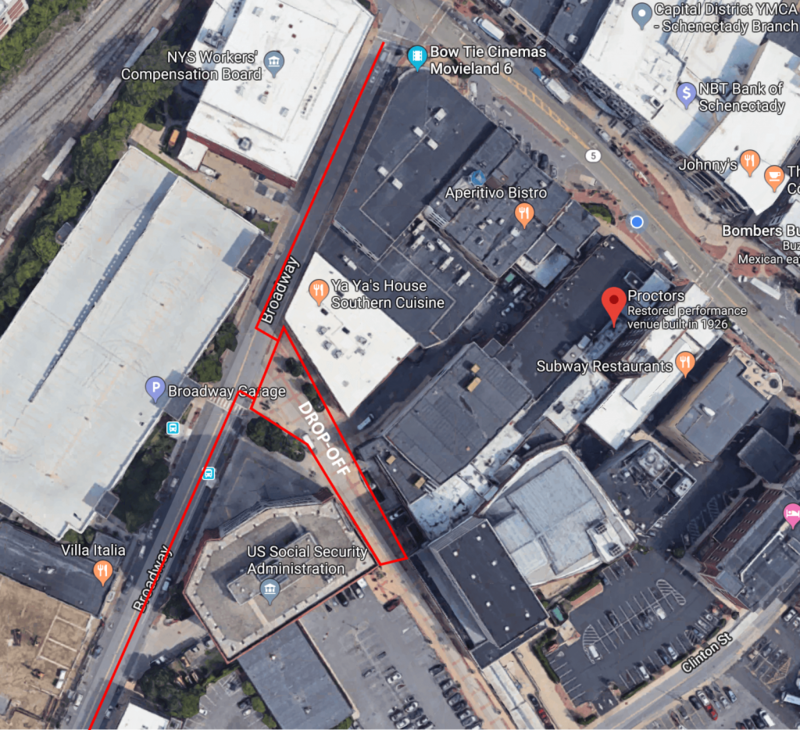 Tour Bus Parking for Broadway shows: Park and drop off on Broadway – in front of NYS Lottery Building Area will have cones and bus signs – room for 6 buses to corner of Hamilton Street. Additional bus parking on Broadway below Hamilton Street. • Turn right onto Union Street. • Turn left onto Smith Street and follow directions from Proctors volunteers to Stratton Plaza, rear marquee entrance. Film: BLIND WOMAN'S CURSE w/Meiko Kaji!